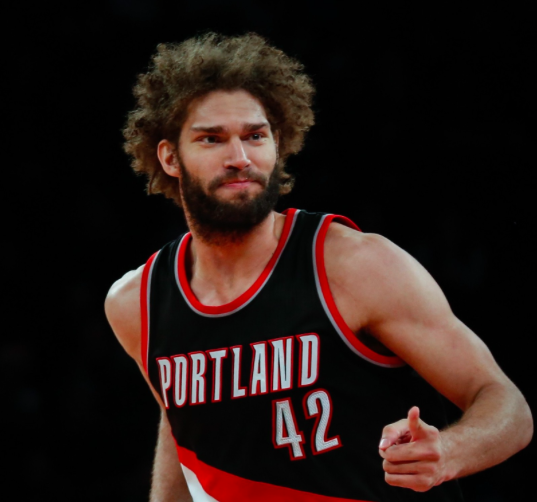 Robin Lopez has committed to sign with the Knicks, according to reports. The 27 year-old center, twin brother of Nets star Brook Lopez, played for Portland the last two seasons, before which he spent one season in New Orleans and four years with the Suns. Lopez only played 59 games last season due to a broken hand, but only missed two games in the previous three seasons combined. The 7-foot Lopez is a very solid defender and a pretty good rebounder. Offensively, he is not a force, but has a nice touch near the hoop and is sufficiently efficient. He can certainly give his team 10 points a night, even if he is not being featured much in the offense. Lopez had per-game averages of 9.6 points, 6.7 rebounds, and 1.4 blocks last year on 54% shooting in 28 minutes per game. Lopez saw little playing time in the first few years of his career, but has averaged nearly 30 minutes a game the past three seasons, and will certainly see at least that many in New York, where he should be the unquestioned starting center and the team’s anchor on the defensive end. Lopez has career per-36-minute averages of 14 points, 8.6 rebounds, and 2 blocks. Lopez is a career 76% shooter from the free throw line. Lopez’s contract will pay him $54 Million over 4 years. There is one caveat, however: Lopez has committed to the Knicks, but the Knicks have made it clear that they will only finalize the deal in the (likely) event that DeAndre Jordan turns them down. Once the Knicks finalize the Lopez contract, they will have somewhere around $7.5M left in cap space, although that number could go up to $11.5 if they waive José Calderón, and $15M if they trade him without taking back any salary. This entry was posted in Articles and tagged KNICKS, KNICKS MEMES, Knicks news, robin lopez, robin lopez deandre jordan, robin lopez knicks, tommy rothman knicks on July 3, 2015 by Tommy Rothman.